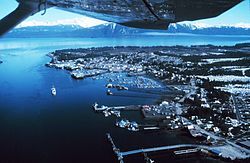 Petersburg is a city in southeast Alaska, United States. It is on Mitkof Island. There are no bridges so Petersburg can only be reached by air or sea. This page was last changed on 21 June 2018, at 18:26.